In much of the world, checks and other physical payment instruments contain hidden security features printed in ultraviolet (UV) ink. This has obvious benefits in the fight against fraud and counterfeiting; but until fairly recently, the only way to see these features was via manual inspection with a UV light. Now we’ve brought automation into the game, with the world’s best-selling ultraviolet check scanner, the TellerScan® TS240-UV, The SmartSource Pro Elite-UV, the fully-featured TellerScan®TS500-UV, and the lower cost CheXpress® CX30-UV. Automated UV scanning allows you to inspect 100% of documents in real time, and catch suspicious transactions before they make it into your processing queue. Even in countries where UV is not standardized enough for full automation, many banks report the mere presence of an ultraviolet-capable machine at the teller window has deterred a significant number of would-be fraudsters. As many countries with ultraviolet security modernize their banking systems, check truncation or image-based clearing is often appearing side-by-side with UV, which demands both a visible light and an ultraviolet image to be captured simultaneously. 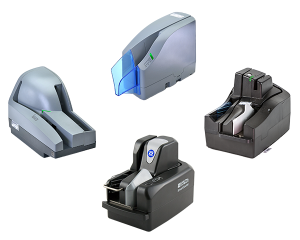 Digital Check® makes the only devices on the market that can produce both images without any loss of scanning speed. Ultraviolet security comes in all shapes and forms, from simple yes/no tests like UV fibers, to advanced features like bar codes and algorithmic serial numbers that can only be read by machines. To learn more about the types and uses of UV security around the world, see our free white paper, Ultraviolet Cheque Security: Understanding a new Era of Fraud Prevention. Although it is not likely that UV scanning will be a requirement in the United States, mainly due to the challenge of replacing the existing infrastructure and the lack of compatible software, UV scanning equipment is still available for specialized purposes.